Here at OETA, we’ve had a very loyal, very tall companion ever since we moved into our building. It’s our TV tower. Technically, the tower belongs to our neighbors, News 9 (KWTV). But until the switch to digital (remember all those commercials about converter boxes? ), both KWTV and OETA had antennas up there. If you ask the folks that work under the tower, they’ll have all sorts of stories about it. I’m not kidding. These are all stories I heard when I started working here. Since then, I’ve heard the howl, the crackling, and seen the sway. And, as happens a lot in my life, I’ve become rather frightened of it. But it really does have some awesome history. When it was built in 1953, it was the tallest man made structure in the world (until another TV tower built in New Mexico went higher in 1956). At 1,576 feet, it’s taller than the Empire State building. 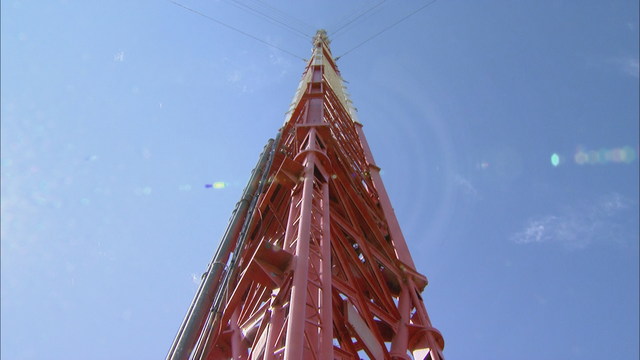 In fact, that’s where Channel 9’s call sign came from – the “WTV” in KWTV stands for “world’s tallest video”. There are actually a lot of folks who are really sad to see it go. Some even dressed up as the tower for Halloween (ahem, Holly Emig). So, in honor of our really tall backyard buddy, we are working on several new episodes of What’s the Deal that will focus entirely on our tower. We’ll talk about how it works, how it’s built, and how they are going to take it down. Stay tuned. It’s gonna be awesome.